Several people have asked for a review of the Native Slayer fishing kayak series. Here we provide you with the results of that research, since kayak fishing is changing the face of kayak design. We hope you find this information enlightening and will help you choose the best fishing kayak for your needs. The Slayer kayak series from Native Watercraft was designed specifically with the fisherman in mind. 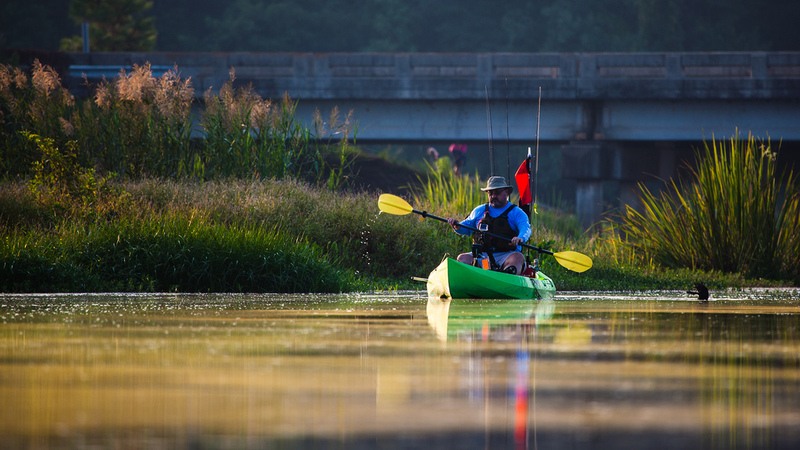 Many of the hallmark features of this craft will appeal to fishermen and recreational sport kayakers alike, so even if you aren’t looking for a fishing kayak, you may want to consider the Native series. Native Watercraft manufactures four kayaks in the Native series including the Native Slayer 12, the Native Slayer 14.5, the Native Slayer Propel 10 and the Native Slayer Propel 13. The first two kayaks are paddled kayaks and the the Propel models have a pedal-powered propulsion system. If you’re in a super hurry, you can go here to see the Native Slayer series at Amazon. Or continue reading. 1.1 What’s the hull like? 1.2 The seat: Is it comfortable? 1.3 How can you accessorize this kayak? 1.4 What’s the carrying capacity? 1.6 Stability: Can you stand up in this thing? 1.7 What are the differences between the Slayer 12 and the Slayer 14.5? 1.8 What kind of color choice will you have? 1.9 Where can you get your hands on a Slayer 12 or Slayer 14.5? 2.1 What’s the same with the Slayer Propel vs. the Slayer paddle models? 2.4 Why choose the Slayer Propel 10 vs the Slayer Propel 13? 2.5 What’s it like to stand and fish in this kayak? 2.6 Where can I get a Slayer Propel? The Slayer sit on top fishing kayak is manufactured in the United States of rotomolded high density polyethylene, shiny and extremely durable. These two kayaks have similar features so we will highlight each feature and give you any differences. The hull of the Native Slayer is fairly flat to make it very stable across the board, with a slight vee chine bow to stern. The bow is slightly rockered to aid efficient movement through chop, but still low profile for super-straight tracking. The Slayer 12 is 12ft long and 31in wide, while the longer body of the Slayer 14.5 (14ft 6in) is slightly narrower at 30in wide. This substantial width helps with the stability. 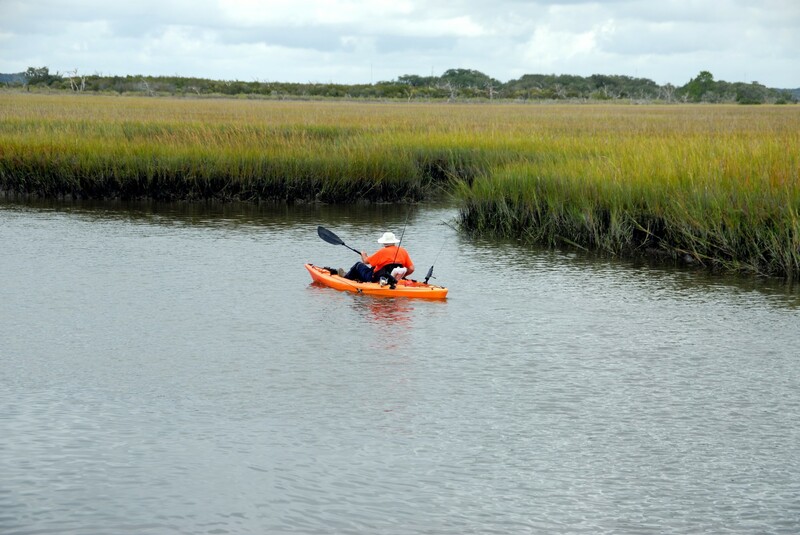 It also gives enough room for the fisherman to stand to paddle or cast, yet the kayak remains relatively easy to turn. Both models are lower profile at 12in high and draft only about 3 ½ in, making them ideal for accessing shallow fishing areas without hanging up or grounding. You’ll be able to reach areas that other kayaks won’t and you’ll be quiet and stealthy about it. Stability is great for these kayaks. It is possible to hang your legs over the side without capsizing or even without feeling uncomfortable or tippy. And it’s easy to re-enter if you do happen to fall out. Eight scupper holes in the bow, stern and midsection come with Super Seal scupper plugs to keep you as dry as you may require for whatever paddling situation you find yourself in. The seat: Is it comfortable? The sling-style frame seat is reputed to be one of the most comfortable seats in the industry. It is adjustable in the low position for paddling and the high position for stationary work. The adjustments are about 6in apart. The mesh sling fabric is breathable and lets water filter through so you don’t sit in a puddle. It was designed for use for long periods of time on the water. It has lumbar support and is designed not to create hot spots of irritation. The tension of the fabric in the frame also makes a “spring” that maintains the seat open when using it or closed for storage. If, for some reason, you need extra padding, or height, optional pads for seat and back are available. The foot rests can be adjusted easily by hand while sitting in the seat. Storage: What’s there? What’s not? The current design of the Native Slayer 12 and Slayer 14.5 has an open bow and stern tank well configuration. This has been much requested by fishermen since the original design. Bungees are installed to keep your gear secure. The stern tank well has molded ridges to fit a 5-gallon bucket, a standard milk crate or an over sized milk crate. If you desire an enclosed space, an optional bow hatch cover is available separately. Optional custom sized bags are also available for these spaces. There is a bungee tie-down for a tackle box between the footrests as well as Plano box storage on either side of the seat. There’s a beverage holder on the floor below the seat. There is a small drywell in the flat area behind the seat that has a sealed cover and a cup for small items like keys and cell phone. The interior of the kayak is accessible here, minimally. The interior is also accessible by removing the top of the center console, if needed, to install electronics like your fish finder or other features. This little access hatch is attached with molded nuts so you won’t strip them out when removing the screws. How can you accessorize this kayak? One of the most exciting features of the Native Slayer kayaks is the ability to accessorize. There are already a lot of great features about the kayak including two flush-mount rod holders behind the seat and lots of purpose-designed storage space to fit your current stuff. There is lots of padding on the floor of the craft to keep things quiet and comfortable when you are standing to fish. There’s also a padded rod rest on the center console. What really sets this craft apart from the competition is tons of track space for adding accessories. There is nearly 12 feet of accessory track on the sides, bow and stern for you to put all your favorite tools and toys. Most of these will install with just a twist. There is a bit of track on the center console for that fish finder we mentioned above. Or you can keep things sleek and simple if you fly fish. There’s not a lot to catch on while stripping line. The Slayer 12 has a payload capacity of 400 lbs while the Slayer 14.5 can hold up to 450 lbs. The Native Slayer design incorporates molded notches for the rigid, padded handles, located in the bow, stern and on both sides of the kayak. Native Watercraft considered the opinions of users when they added this feature to help reduce hand and knuckles getting squashed, which tends to occur with the flexible nylon handles. So you’ve got more comfort there. They also added a wheel on the stern end to help maneuver the boat on hard surfaces, though you might want to turn it around when pulling it across soft surfaces like grass, dirt or sand. This is designed to help with one-person transport of the craft. Some people do seem to find it difficult as they say it gets “squirrelly” and has a tendency to twist. Other people really like it for the convenience. Two-person carry is ideal, though. The Slayer 12 weighs 65lbs and the Slayer 14.5 is a substantial 70lbs. Either of these will go on your roof topper on your SUV, but will probably require two people to get it up there. Stability: Can you stand up in this thing? One of the great features of the Slayer series of kayaks is that they are superior for their stability in the standing position. The flatter hull design was created with stand-up fishing in mind. The floor area is wide for plenty of room for a wide stance and the foot area is padded for comfort and quiet. You may want to check out the video later in this article to get an idea of what’s it like to be standing in the kayak. The hull design is the same for the Propel models so it is a good comparison. Click to go to video. What are the differences between the Slayer 12 and the Slayer 14.5? Both of these kayaks share the fantastic features of great initial and secondary stability and superior tracking. They both have purpose-designed storage and accessorizing features, as well as that comfortable seat. The longer Slayer 14.5 has more storage space and load capacity. It is going to be slightly faster due to the extra body length and the narrower width (1in. narrower). You might choose the Slayer 14.5 if you fish in larger bodies of water where you might want to cover more distance. You might also choose this craft if you need the extra 50lbs of weight-bearing capacity, either for your size, your gear size, or the fact that you always bring in the biggest catch! The Slayer 12 will be slightly more maneuverable and easier to turn due to the shorter length. You might choose the Slayer 12 if you need to fish small inlets or narrow creeks or rivers, or just any place that has accessibility issues. What kind of color choice will you have? Sure. Both Slayer kayak models are available in one solid color (Grey Storm) and four “tye-dyed” looks: Blue Lagoon, Copperhead (red pattern), Hidden Oak (brown pattern), Lizard Lick (green pattern). Of course each of the kayaks, other than the solid color, will have a uniquely different color pattern due to the way the kayaks are manufactured. But, hey, do you really want one that looks like everyone else’s? Where can you get your hands on a Slayer 12 or Slayer 14.5? Click here for more features and pricing for the Slayer 12. Click here for more features and pricing for the Slayer 14.5. If you love the features of the Native Slayer series, but you like the idea of hands-free movement, continue reading below. Native Watercraft has introduced two exciting kayaks with pedal-powered propulsion for the fisherman who wants a hands-free fishing experience. The Native Slayer Propel 10 and the Native Slayer Propel 13 are two of the latest and greatest additions to the pedal-propelled kayak market. What’s the same with the Slayer Propel vs. the Slayer paddle models? Both of the Slayer Propel models come with all the advantages of the Slayer hull design and much of the interior features are the same. You will get all of the moving stability and tracking capabilities of the Slayer 12 and 14. And you will have the stand-up stability that you need, with the same padded deck. You’ll get the same super-comfortable seat and lots of tracks for adding all your toys and accessories. You can have the same choices of colors. So what’s the big deal? The big bonus to the Slayer Propel models is the Propel Pedal Drive System that allows you to pedal in forward AND in reverse. This means you have ultimate control of your situation and you can almost literally stop on a dime. You can slide up next to a dock or structure with ease. You can move in and out of small inlets. You can simply hover over an area with stealth, even in a mild current. The Native Propel Pedal Drive System is simple and easy to use. It allows you to move at 4.2 miles per hour with a relaxed pedal stroke. Then you can kick it up to 5.2 miles an hour if you need to haul! The left hand rudder handle control moves the impact resistant stern rudder, while keeping your right hand free to hold your fishing rod. The Slayer Propel models also come with the hard cover with bungee for the bow tank well. Besides the two flush-mounted rod holders behind the seat, there’s a forward-facing flush-mount rod holder on the right side as well, which also doubles as a cup holder when you don’t have a rod in it. The Propel system is designed for a 12in to 18in water depth, but if you need to get in shallower, you can simply lift the pedal drive up and the included center console just fits into the space. The drive is also completely removable if you want to leave it at home and go for a paddle trip. Unlike the Slayer paddled kayaks, the Slayer Propels do not come with a stern wheel, because they have the rudder at the stern. Why choose the Slayer Propel 10 vs the Slayer Propel 13? The Propel 10 is 10ft long while the Propel 13 is 13ft 2in long. These models are both wider than their paddled Slayer counterparts in order to accommodate the drive system and maintain floor space for stable standing room. The Propel 10 is 34in wide and the Propel 13 is 33in wide. They both have a weight capacity of 400 lbs. The Propel 10 weighs 59lbs while the Propel 13 weighs in at 85lbs. You will have similar considerations for choice between these two models as with the Slayer paddled kayaks. The Slayer Propel 13 is going to be a bit faster for those larger bodies of water. It’s going to allow you more storage space for your goodies. That 85lb weight with no stern wheel is going to make this craft a bit more difficult to manage outside the water and may require two people. The Slayer Propel 10 is going to be your choice if you want a more nimble craft for smaller spaces with all of the fine features and pedal power of its longer cousin. At only 59lbs, it’s the lightweight of the whole Slayer family. And the short length is going to make this one easy to pop into your pickup truck bed or on top the SUV rack, probably even by yourself. What’s it like to stand and fish in this kayak? See a demonstration here of a man fishing from the kayak. It is rather long, but you will get a good idea of the stability of the craft in the first minute. At 4:29, you can see him easily and quickly adjusting the position of the kayak from a standing position by rotating the pedals by hand. Where can I get a Slayer Propel? The latest pricing and availability can be found here for the Native Slayer Propel 10. You can see the pricing and features of the Native Slayer Propel 13 here. The Native Slayer series of kayaks are all well-made with so many great features that you are going to be thrilled with the choices above. You just need to decide which features suit your purposes and we hope we’ve included the information that helps you make that decision best. We hope you will take the time to tell us your personal experiences with any of the Native Slayer models and give us your insights. Please do so below in the comments. Or tell us anything about your experiences with other models. We would love to hear from you! Happy Kayaking from us here at Aquamarine Watersports! This entry was posted in Kayak Reviews, Sit On Top Kayaks and tagged Kayak Reviews, native slayer, slayer propel on July 18, 2016 by Diver S.
Thank you for the insightful review. Also, the video was helpful as my brother-in-law would use it for fishing. I guess kayaks have come a long way since I was a child. The one we had was prone to tipping and we had to make that part of the experience. much more stable. Sounds like fun. I appreciate your insight into the weight – it’s good to know that it would take 2 people to get it up onto the car roof – but it’’s never good to be out on the water alone anyway – is it? Would this be useful for recreational paddling a bit, as well as fishing? Dawn, you certainly can and many people do. It is best suited for calmer waters like bays, lakes, inlets and slow moving rivers and streams. Also, the Native Slayer Propel’s pedal drive can be lifted or even completely removed and left at home if you want to simply paddle. The Slayer looks like a great fishing kayak. I had no idea there was the Propel style. I guess that would be really awesome on a lake when you are fishing. Human power slow trolling. Wow you can really move out with the pedal power! These truly have a rudder and not just a drop down cag? Pretty cool. I love kayaks and have 3. I need to put some rod holders and paddle holders on. They are nothing as cool as the ones you have here!! I would not dare stand up in mine, although they are quite stable for floating. Makes me want to upgrade especially for fishing! My son-in-law was just talking about the peddle vs. paddle kayaks so I went looking to find out what it was all about. Thanks for the reviews. I will pass this link on to him as I know he is really interested in having one out here at the lake. My family is getting together and chipping in to surprise my brother in law with a new kayak for his birthday. He always shares his current one with all of us, so we figured it would be a wonderful gift! I’ve been assigned the task of researching. He’s always talking about the Native Slayer Propel (he’s a fisherman), and thanks to all of the detailed information you have provided here, I need to look no further. Thank you so much! Thanks for the in depth review. Can I comfortably fit my dog in it? He likes to come too. Hi Elizabeth. People do bring their dogs on their Native kayaks. The open stern well would accommodate a dog. Just make sure your weight plus dog weight plus your other payload doesn’t exceed the operating weight of the kayak. Sounds like fun!